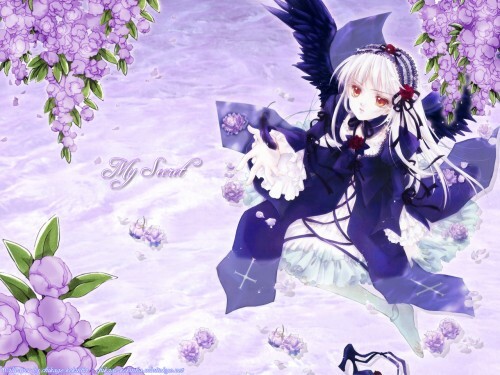 This wallpaper is the winner of Rozen Maiden Contest! This wallpaper gave me some work because I began do it on the notebook and when I passed for my computer the shine and the contrast were completely different, because my noteboook is badly configured T_T, then I had to arrange everything. I really like suigintou then I decided to do a wallpaper with her! Well, the scan really looks like it was cut out and then pasted on top of the background, as well as the flowers. The water is a bit blurry and the scan is rather grainy :\ You're capable of walling better. I can't say I like Rozen Maiden as a series, but I do like the art. This looks like a doujin scan though, who is the artist? It kinda resembles the lady who draws Basara to me. Love the wall, + fave. This is very nice...nice flowers..i like it! Alrighty where do I start? that looks good in this wall is the text. is horrible and the flowers are grainy and jagged. inside and the outside can use some more work. Wonderful, the BG, colors, flowers, the girl, all is great, a good work, I like very much. nice wallpaper, the background is nice and beautiful. the flowers is great. colours and texture is good. I love this wall! It's so beautiful! Oh this is so very pretty! I love the scan you used and the flowers and all of it matches great together! Great job! wow. i love this picture. the background is amazing! it's one of my favorite colors!